HOLLYWOOD—The rain wasn’t going to stop the Jaeger cadets as they stepped onto the red carpet Wednesday night for the global premiere of Universal Studios’ “Pacific Rim Uprising.” The red carpet was covered by a canopy keeping the cast of the second installation of the “Pacific Rim” franchise dry as they stopped and posed for event photographers, were interviewed by the press and signed autographs and took selfies with fans before heading into the TCL Chinese Theatre for the screening of the highly-anticipated sequel. For many of the actors playing the cadets, it was their first major Hollywood red carpet premiere and they couldn’t contain their enthusiasm. For Lily Ji who plays Cadet Meilin, it was also her first time in Los Angeles and the U.S. “It’s just amazing to be here. for a film I worked on for an international premiere, I’m so excited,” said Ji. Actor Wesley Wong was just glad to be back in Los Angeles as he used to live in the city while attending USC for his undergraduate studies. During the days prior to the premiere, Wong was able to explore Los Angeles with the other cast members along with other locally based actors. 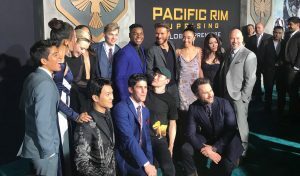 The film’s star John Boyega and fellow actors marveled at the beauty and importance of diversity represented in the film’s cast. “Pacific Rim: Uprising” opens nationwide Friday, March 23.